I love a bit of Visio, and since I’ve not shared any Visio on my blog in what seems like ages, I thought I’d share this! The NetApp FAS/AFF8080EX has a lot of on-board ports and 12 x IO card expansion slots. 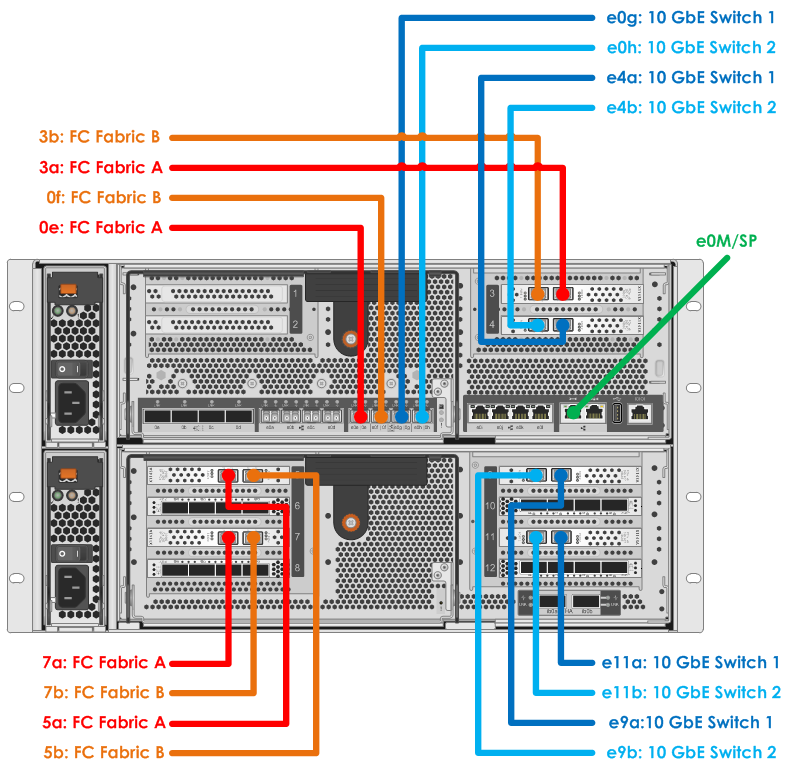 If you populate 6 slots with dual-port UTA2 cards (that can do either FC or Ethernet), and 4 slots with quad-port SAS cards, and have balanced FC and 10 GbE front-end connectivity requirements, and following Hardware Universe priority slot assignments, we can draw up something like the diagram below. I’ve drawn it as there being two FC fabrics - FC Fabric A and FC Fabric B. And I’ve imagined we’re plugging into two Ethernet switches - Switch 1 and Switch 2 - and we’d have two LACPs - set 1 for Switch 1 of e0g, e4a, e9a, e11a, and set 2 for Switch 2 of e0h, e4b, e9b, e11b. 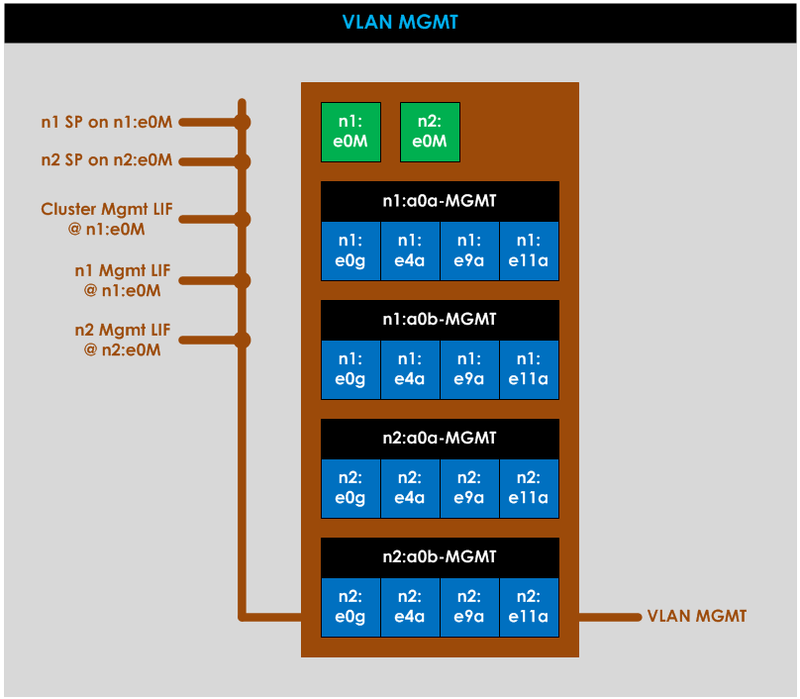 I thought I’d point out why I’ve only drawn 1 * 1 GbE connection in the diagram (we don’t need to use the other 1 GbE ports, but can if wanted.) 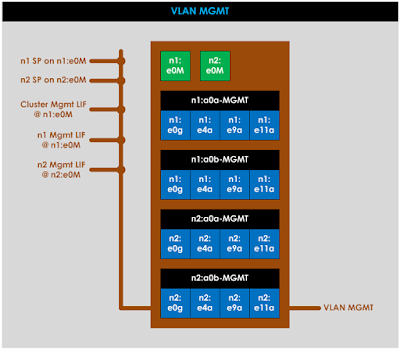 This is because the MGMT VLAN can be presented to our LACP ports, as covered by the diagram below, which shows the management network, and Cluster and Node (includes Service Processor) management connectivity (SVMs aren’t considered in this post.) The SPs can’t move port, all the other management LIFs can fail over to other ports if their home port (represented with the @) goes down. As always, comments are great and much appreciated. If you had this kit, would you do the front-end connectivity differently? And if so, why?